JPI Healthcare Solutions will be attending Seatrade Cruise Global Expo April 9-11. Seatrade Cruise Global unites more than 11,000 cruise line professionals “to build on existing global alliances, establish new business relationships, and discover the trends and ideas reimagining the cruising seascape.” While a tourism-oriented trade show may seem out of the sorts for a medical equipment supplier, think again. In recent months, JPI has had the good fortune of being asked to work with Medpod, Inc., a software company revolutionizing the delivery of care with augmented medicine solutions. Medpod integrates proprietary telehealth software with best-in-class professional medical and laboratory devices for groundbreaking telediagnostics with real-time active polling and transmission of patient clinical data. 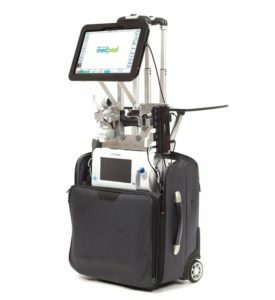 Medpod has integrated JPI’s portable x-ray and PACS technology as an option in its Medical Cart and MOBILEDOC®, a revolutionary highly portable bag packed with advanced telediagnostics, which is intended to make quality care more accessible to patient populations who currently require costly modes of care, as well as patients who demand convenience without compromising the quality of care received. Medpod and JPI Healthcare Solutions will be on site in Booth #1215 in the Wellness Area, which is being sponsored by UNIMED. You can learn more about MOBILEDOC® on the Medpod website.